Breaker fumbles led to two big scores and the Estancia Eagles rallied past Laguna last Friday, Oct. 23, at Guyer Field to spoil the milestone homecoming contest. Jack Simon ranks fifth in school history with career total offense at 3,799 yards, surpassing Drake Martinez (3,533 yards 2010-12.) Photo by Dante Fornaro. Laguna controlled the tempo early grinding out a long 14-play drive for the first score that almost never happened. On the fifth play from scrimmage, Laguna went back to punt from their 36 yard line when the ball bounced off the back of a Laguna lineman to a surprised Jack Simon, who ran 14 yards and kept the drive alive. Breakers eventually scored on Simon’s six-yard toss to Adam Armstrong, who spun around a defender for an additional eight-yard run for the touchdown. After George Cracknall’s kick for the extra point, Estancia scored with a 65-yard lateral pass play to a wide-open receiver. Breakers coughed the ball up on a fumble on their next possession, but Estancia settled for a field goal. Laguna’s next possession ended in another fumble and four plays later Estancia was up by 17-7. The home squad drove 83 yards in eight plays to make it 17-14 after a Simon run and Cracknall kick. The key play was a Matt Hayes 17 yard run off a short pass. Estancia came right back on a 67-yard drive to make it 24-14, but Laguna response could only go 35 yards before turning the ball over on downs. After half-time, Estancia took the second half kickoff 70 yards in seven plays to conclude the scoring while Laguna’s four possessions of the second half never sustained consistency to threaten. The final two regular season games are on the road with Laguna facing Calvary Chapel on Oct. 30 at Ocean View High School. Orange Coast League: Godinez, 2,538; Saddleback, 1,688; Estancia, 1,274; Laguna Beach, 1,038; Calvary Chapel, 522. Nearby public schools: Aliso Niguel, 3,017; Dana Hills, 2,663; University, 2,643; Newport Harbor, 2,300; Corona del Mar, 1,729. 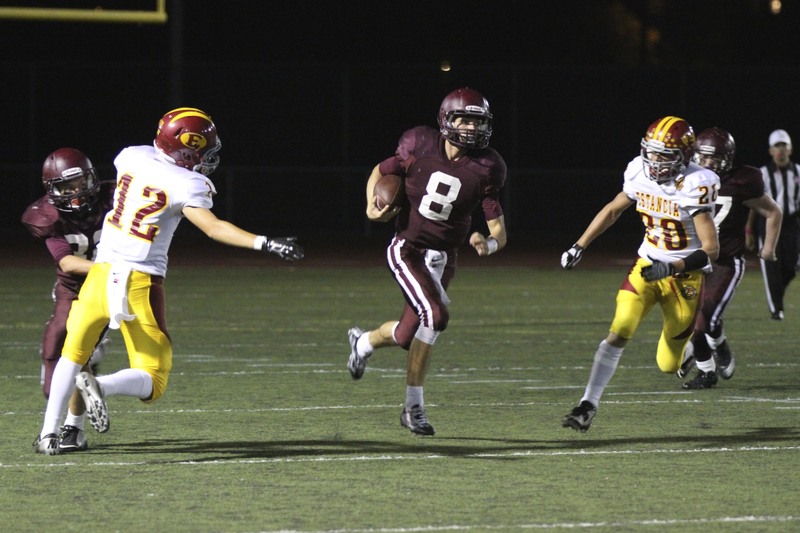 Privates: Mater Dei, 2,145; Santa Margarita, 1,730; J Serra, 1,180; Sage Hill, 506; St Margaret’s, 464.